Puerto Rico has a rich culture whose origins can be traced back to native Taino, Spanish and West African roots. While we know much about our Spanish and African roots, our Puerto Rican community at large knows little about our Taino Heritage. The Conquistadors explored Puerto Rico on Columbus' second voyage to the New World, November 19, 1493. At that time the Island was populated by hundreds of thousands of Taino, a gentle, peaceful indigenous people who called the island Boriken, the Great Land of the Valiente and Noble Lord. During this period there were millions of Taino living in islands across the caribbean including Puerto Rico, Cuba, Haiti, Dominican Republic, Jamaica, and the Bahamas as these islands are known today. Taino had a lively intelligence and a pure mind with a natural goodness that shined through. They lived in small yucayeques (villages) led by a Cacike (Chief) and subsisted on hunting, fishing and gathering of native cassava root and fruits. At the center of a yucayeque was a batey (ceremonial plaza). At one end was a caney, a rectangular-shaped home of bamboo and palm belonging to the Cacike. All around the batey were bohios, round homes of the same materials, belonging to the Taino of the village. The Taino believed in one supreme God and held a deep sense of spirituality that was present in every aspect of life. They held many ceremonial events in the batey, including ballgames called batu' as well as ceremonial dances called areytos. 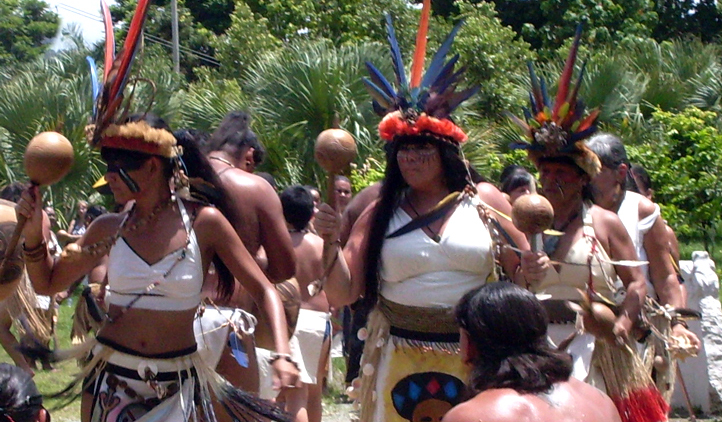 The Taino welcomed the Conquistadores, shared their homes and food and gave the Spaniards many gifts. The Spaniards treated the indigenous population severely, enslaving and exploiting them, forcing them to work in mines to search for gold, in construction, and in agriculture. The Taino population rapidly declined from the slave labor conditions and the new European diseases for which they had no immunity. 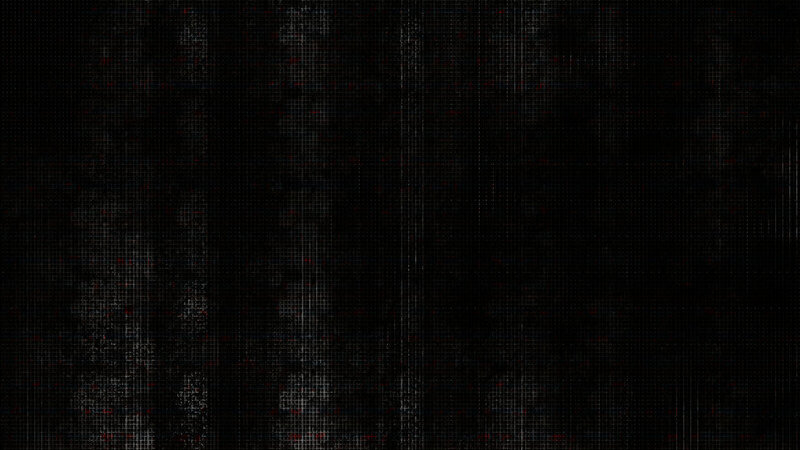 Horrific numbers were slaughtered. Some took their own lives to escape the brutalities and indignities that were being repeated on other islands across the Caribbean. History recorded that by the mid-sixteenth century the Spanish Conquest had decimated Puerto Rico's indigenous people. However, as we know "history is written by the victors" (Winston Churchill). In reality, Taino were not completely extinguished. Petroglyphs in mountain caves and restored ceremonial grounds testify that Taino escaped high into the Cordillera Central, the mountain range that runs across the central interior of Puerto Rico, and quietly continued living their traditions. Others escaped from the island in canoes. A census in 1514 found that 40 percent of the officially recognized wives of Spanish men were Taina. The 1778 census recorded thousands of full-blood Natives, many living in the remote mountain regions of central Puerto Rico such as "Las Indieras." After 1800, the Indian category was dropped from the census, forcing native people to be reclassified into other racial categories. In 1899, a US War Dept Census reported that "Indian types" were everywhere in the mountain settlements. Because of this history, it's not surprising (in retrospect) to learn that in his year 2000 National Science Foundation research, Juan Carlos Martinez Cruzado, Professor of Genetics at the University of Puerto Rico-Mayaguez, found that 61% of all Puerto Ricans carry Amerindian mitochondrial DNA from their maternal lines -- just from their mother's side. In other words, Taino were not extinguished, they were assimilated! Taino traditions survived, handed down from mother to child -- the food they ate, home remedies when they didn't feel well, songs, music, dances, storytelling, spiritual beliefs, and more -- to become a permanent part of our island's heritage. Musical instruments such as maracas and guiro, words like iguana, manatee, and huracan (hurricane), inventions like the hamaca (hammock), tabaco (tabacco) and barbacoa (barbeque) are all part of that legacy. While the Taino are relatively-unknown to many, their legacy today is recognized world-wide including musical instruments (maraca, guiro), inventions (hamaca/hammock, barbacoa/barbeque), common words (huracan/hurricane, maisi/maiz/corn), animal names (iguana, manatee), and more. 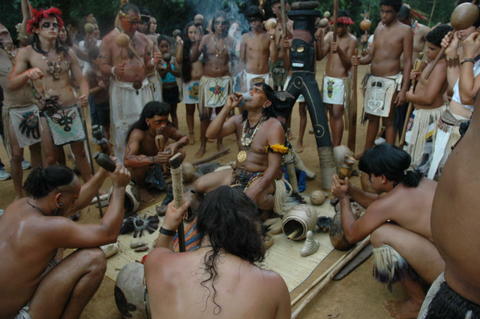 The Taino introduced the Conquistadors to tobacco (tabaco) and sports played with a rubber ball (batu). In Puerto Rico and other Caribbean islands, actual surviving Native communities and families of Native ancestry are increasingly revealing themselves, and restoring their heritage. A 2002 study by the Smithsonian Institute's National Museum of the American Indian documented families in high mountain regions across the Caribbean where the inheritance and legacy of Taino ancestors are still present. They live indigenous lives and have preserved traditions that have been passed down through the generations, from very early contact times. These descendents hold land and maintain a social and spiritual culture. They continue traditions such as the preparation of cassava bread, traditional weaving, instrument making and other artisania, canoe crafting, and the observance of important ceremonies. To this day, there are many in Puerto Rico who use medicinal plants and farming methods that come directly from our Taino heritage. 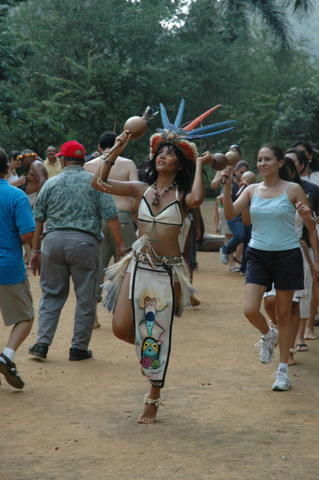 Taino culture is very much alive in all of Puerto Rico, through our vocabulary, music, customs, culture, beliefs and the nature of our people. There's a "resurgence" on the Island and on the Mainland -- Taino descendants are "waking up" to a calling to reconnect to their heritage -- and it grows stronger every day. For that reason, it is important that we learn more about our first root, our Primera Raiz. We cannot be a complete people without understanding the legacy of the Taino that is part of our fabric, and the traditions that we still enjoy today. Here are Taino Resources to learn more. Photo Credits: Photos of Tekinas (Dancers) El Concilio Taino Guatu Ma Cu A Boriken Other photos copyright: Hilda Morales & Concilio Taino. Used with Permission. Bartolome de Las Casas, "Brief Account of the Devastation of the Indies (1542)". Translated by Nigel Griffin. Penguin Classics; 1st ed edition (September 8, 1999). FRAY Ramon Pane, "An Account of the Antiquities of the Indians", A new edition with an introductory study, notes, and appendixes by JOSÉJUAN ARROM, translated by SUSAN C. GRISWOLD, DUKE UNIVERSITY PRESS, Durham & London 1999. Wagenheim, Kal and Jimenez de Wagenheim, Olga, "The Puerto Ricans: A Documentary History," Markus Wiener Pub., 1996. An Interview On the Taino DNA testing in Puerto Rico Of Juan Carlos Martinez, Delware Review of Latin American Studies, "Profiles", Vol. 1, no. 2, 15 August 2000. Surviving Columbus in Puerto Rico: the myth of extinction, Editorial in Indian Country Today, 06 October, 2003. Dr. Lynne Guitar, "Documenting the Myth of Taino Extinction", KACIKE: Journal of Caribbean Amerindian History and Anthropology. Special Issue: NEW DIRECTIONS IN TAINO RESEARCH, 2002. Irving Rouse, "The Tainos: Rise and Decline of the People Who Greeted Columbus," Yale University Press, 1992. Antonio M Stevens-Aroyo, "Cave of the Jagua," University of Scranton Press, 2006. Ricardo Alegria, "History of the Indians of Puerto Rico," Editorial Collection de Estudios Puertorriquenos, 1970. 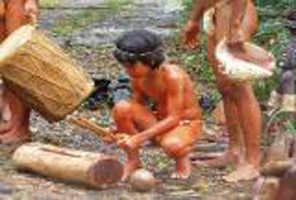 Melba Rerrer, "UPR study finds high Taino DNA rate: Tests contradict theory of extinction of P.R. natives," San Juan Star, Sunday 18 April 1999.